The transportation sector is the largest source of U.S. greenhouse gas (GHG) emissions; most of which are carbon dioxide emissions. Federal and state vehicle emissions and fuel economy standards are set by three agencies: the Environmental Protection Agency (EPA), the National Highway Traffic Safety Administration (NHTSA), and the California Air Resources Board (CARB). In 2018, NHTSA and EPA proposed new and revised standards for model year 2021-2026 light-duty vehicles. The standards would conflict with California’s existing GHG emissions standards, creating uncertainty for the auto industry. EPA is also proposing to revoke California’s authority to establish GHG emissions standards. A California-led coalition of states has sued to challenge the change in direction. The transportation sector is the largest source of U.S. greenhouse gas (GHG) emissions, surpassing the power sector in 2015. 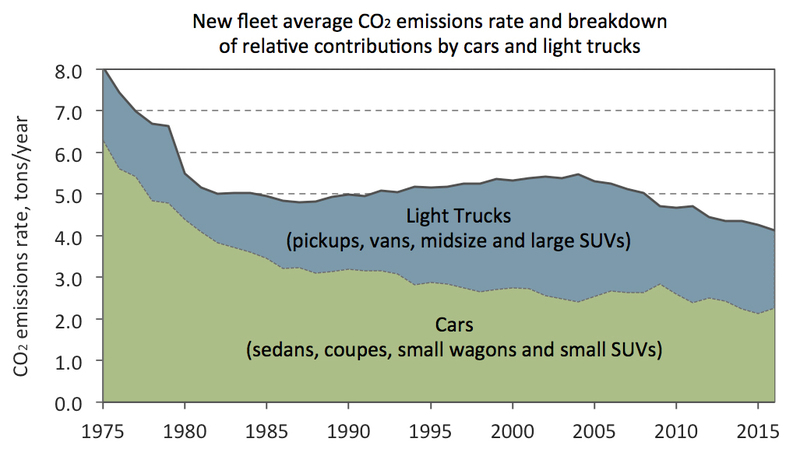 Cars and light-duty trucks are responsible for about 60 percent of transportation emissions. Medium- and heavy-duty vehicles, which include tractor-trailers, large pickups and vans, delivery trucks, buses, and garbage trucks, produce about 23 percent of transportation emissions. Current emissions standards for model years 2022-2025 are expected to achieve an industry-wide fleet average of 173 grams of carbon dioxide equivalent (CO2e) per mile in model year 2025, which is projected to be equivalent to 51.4 mpg if the automotive industry meets the target exclusively through fuel economy improvements. EPA also projects that automakers could meet this emissions compliance level with average real world/label fuel economy of 36 mpg. In the final weeks of the Obama administration in January 2017, EPA determined that the emissions standards developed in 2012 for model years 2022-2025 remained appropriate. EPA cited the success of automakers in meeting early standard requirements and a seven-year growth in U.S. auto sales as reasons to expect that automakers could affordably continue to meet the standards. The California Air Resources Board concurred with the EPA’s determination in its own midterm review of California’s vehicle standards. California found that automakers were successfully and affordably deploying advanced technologies to meet fuel economy requirements and the state’s zero-emission vehicle program. In March 2017 following a change in administrations, EPA under the Trump administration announced that it would revisit the midterm review decision to maintain emissions standards through 2025, took public comment, and held a public hearing. In April 2018, EPA issued a reconsideration of the midterm evaluation of the light-duty vehicle emissions standards through 2025, concluded that the standards were based on outdated information and that more recent information suggested that the current standards may be too stringent, making vehicles less affordable. EPA concluded that since the 2012 rulemaking finalizing the standards, expectations about gas prices and consumer adoption of advanced technology vehicles had changed. In response, a California-led group of 17 states and the District of Columbia sued in federal court to challenge EPA’s reconsideration. The group includes California, Connecticut, Delaware, the District of Columbia, Illinois, Iowa, Maine, Maryland, Massachusetts, Minnesota, New Jersey, New York, Oregon, Pennsylvania, Rhode Island, Vermont, Virginia, and Washington – states representing roughly 43 percent of the market for new car sales and 44 percent of the country’s population. The lawsuit alleges that EPA’s decision lacked scientific justification. CARB is also considering amending its regulations so that only automakers that comply with the Obama administration GHG emissions standards will be “deemed to comply” with California standards, meaning that compliance with any new emissions standards set under the Trump administration may not equate to compliance with California standards. In August 2018, NHTSA and EPA jointly published a proposed rule for model years 2021-2026 that would freeze the standards at 2020 levels through 2026 to reduce costs for automakers and consumers and to prevent traffic fatalities. The proposed rule argues that increased fuel efficiency standards have a “rebound effect” that encourages more driving and therefore more exposure to the risk of traffic accidents; that increased vehicle costs from increased fuel efficiency standards discourage consumers from purchasing new vehicles and encourage them to keep driving older, less safe vehicles; and that lightweighting of vehicles to achieve fuel efficiency makes vehicles less safe. EPA also proposes to revoke the waiver of federal preemption for California’s Advanced Clean Cars Program, Zero Emission Vehicle Program (ZEV), and Low-Emission Vehicle Program (LEV) on the grounds that climate change is different from the smog-related air quality problems that Congress had in mind when it established the opportunity for a waiver. Without a waiver of federal preemption, California’s authority to maintain these programs would be undercut. The 1975 Energy Policy and Conservation Act directed the U.S. Secretary of Transportation to establish Corporate Average Fuel Economy (CAFE) standards for new passenger cars. CAFE is the sales-weighted average fuel economy in miles per gallon (mpg) of the vehicles in a manufacturer’s fleet. This law was updated in 2007, when Congress increased the fuel economy standards for passenger vehicles and also established efficiency standards for medium- and heavy-duty vehicles. California is the only state allowed to set its own air emissions standards for motor vehicles. California was granted an exception under the Clean Air Act because the state had already implemented standards in 1966 to address its critical smog problem and had established an Air Resources Board (CARB) to oversee them. The Clean Air Act states EPA shall grant a waiver if California’s standards are necessary to meet compelling circumstances and are at least as stringent as federal standards. Other states may choose to adopt California’s vehicle emissions standards without EPA approval. Fifteen states, making up 40 percent of the U.S. auto market, currently follow at least some of California’s vehicle emissions standards, including its fuel economy standards. In April 2010, EPA and NHTSA finalized the first harmonized set of national program standards for Model Year 2012-2016 light-duty vehicles with the cooperation of major automakers and the state of California. These standards applied to passenger cars, light-duty trucks, and medium-duty passenger vehicles. The standards are based on the vehicle’s footprint, which is a measure of vehicle size. Footprints are divided into two categories: passenger vehicles and light trucks, the latter of which includes pickup trucks, vans, and sport utility vehicles. Under the National Program, EPA established GHG emissions standards and NHTSA established CAFE standards; both sets of standards were harmonized to produce one target for automakers to meet. In 2012, EPA and NHTSA finalized the second set of national program standards for model year 2017-2025 light-duty vehicles with the cooperation of major automakers and the state of California. These standards aimed to raise the fleet-wide equivalent fuel economy to up to 54.5 mpg for model year 2025, nearly double the 27.5 mpg required for Model Year 2010 (before the first set of national program standards were adopted). Canada also adopted standards aligned with the second set of national program standards through Model Year 2025. Inclusion of truck hybridization for compliance. Despite this history, in the August 2018 proposed rule, NHTSA argues that the 1975 Energy Policy and Conservation Act preempts California’s authority to regulate tailpipe CO2 emissions through the LEV, ZEV, and Advanced Clean Cars programs. Medium- and heavy-duty trucks make up only 5 percent of vehicles on the road but account for about 20 percent of U.S. transportation emissions. This category includes tractor-trailers, large pickups and vans, delivery trucks, buses, and garbage trucks. Phase 2 standards developed by EPA and NHTSA currently apply to semi-trucks, large pickup trucks, vans, and all buses and work trucks of model years 2021-2027. Phase 2 standards for box trailers that would have gone into effect in 2018 have been stayed by court order. EPA has proposed to repeal Phase 2 emissions standards for heavy-duty glider vehicles, glider engines, and glider kits. In 2007, Congress directed the Department of Transportation to establish efficiency standards for medium- and heavy-duty vehicles after consultation with the Department of Energy and EPA. In 2011, EPA and NHTSA established the heavy-duty national program (known as the Phase 1 standards), the world’s first harmonized GHG emissions standards and fuel economy standards for on-road heavy-duty vehicles of model years 2014-2018. The Phase 1 standards applied to combination tractors, heavy-duty pickup trucks and vans, and vocational vehicles. Some of the standards are exclusively within EPA’s jurisdiction, such as hydrofluorocarbon standards limiting leakage from vehicle air conditioning systems from certain heavy-duty vehicles, and nitrous oxide and methane emissions standards for pickup trucks and vans and heavy-duty engines. The Phase 1 standards did not apply to commercial trailers. In August 2016, EPA and NHTSA finalized the Phase 2 standards for medium and heavy-duty vehicles. The Phase 2 standards were designed to apply to certain trailers of model years 2018 – 2027 and to semi-trucks, large pickup trucks, vans, and all buses and work trucks of model years 2021-2027. The Phase 2 standards are divided into five segments and were designed to help provide manufacturers with flexibility. Combination Tractors: Class 7 and 8 combination tractors and their engines should reduce fuel consumption by 25 percent from Phase 1 standard levels by model year 2027. Trailers: Trailers should reduce fuel consumption by 9 percent by model year 2027, including by improving aerodynamics, reducing weight, and addressing tire pressure and resistance. Heavy-Duty Pickup Trucks and Vans: These vehicles should reduce fuel consumption by 16 percent by model year 2027. Vocational Vehicles: Delivery trucks, buses, garbage trucks should reduce fuel consumption by 24 percent by model year 2027. Engine Standards: Tractor engines should reduce carbon dioxide emissions by 5 percent, and vocational diesel and gasoline engines should reduce carbon dioxide by 4 percent from Phase 1 standard levels by improving air handling, reducing engine friction, or improving emissions after-treatment technologies and waste heat recovery. To provide manufacturers flexibilities, the program allows averaging, banking, and trading among regulated parties in order to speed up implementation of new technologies and reduce the cost of compliance. In addition to substantive changes to the federal vehicle standards, there may also be changes to how the program is enforced. In March 2018, NHTSA proposed retaining the existing penalty of $5.50 per tenth of a mile per gallon for auto makers that fail to meet the CAFE standards, rather than allowing a scheduled increase to $14 per tenth of a mile per gallon to account for inflation. In May 2018, a multi-state group led by California and New York expressed opposition to this proposal. Participants included California, Delaware, the District of Columbia, Illinois, Iowa, Maryland, Massachusetts, New Jersey, New York, Oregon, Virginia, Vermont and Washington. They emphasized that without a robust penalty, automakers will not have an appropriate incentive to manufacture fuel-efficient cars.